Sweet summer corn roasted in the oven and topped of with a light compound butter using fresh cilantro and a pinch of chipotle pepper and cumin. Farm stands carrying fresh sweet corn are everywhere from July to early September here in New York. That is when corn is so sweet and juicy, you can practically eat it raw! Before the corn season ends, I like to buy fresh corn any chance I get. For the compound butter, you can use any combination of fresh herbs you have on hand, thyme butter or chive butter are some of my favorites. 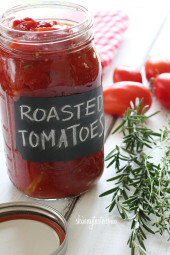 You can make larger amounts and keep it in the refrigerator for at least a week. My original idea for this post was to make grilled corn but I ran out of gas so I needed a plan B. I came across this super easy method for roasting corn in the oven and I don’t think I’ll ever make corn any other way. This was super easy and the aroma of roasted corn that filled my kitchen was wonderful; far easier than grilling corn since you don’t have to keep turning it. Combine all the ingredients to make butter. Set aside in a ramekin. Preheat oven to 350°. When hot, place corn in the middle rack and bake 30 minutes. Remove corn from the oven and set aside for 5 minutes. 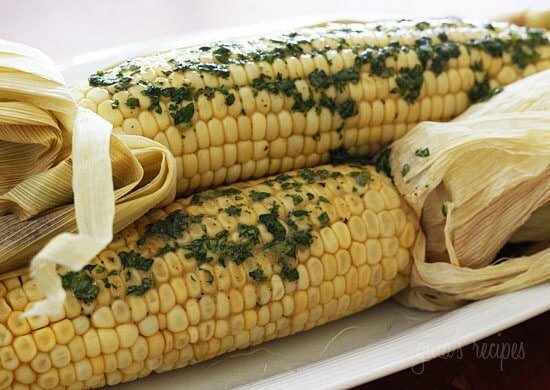 Carefully remove husks and silks from the corn and serve each with 2 teaspoons of cilantro butter. I bought some corn with husks removed. Could you wrap them in parchment paper and get the same result? Gina, I don't have chipotle powder… should I just use chile powder or is there a better substitute?? I will never make corn on the cob another way… This was so easy! Love it.. 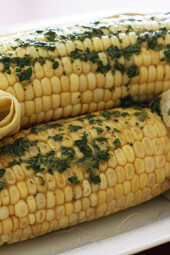 Hadn't thought of cilantro & corn on the cob. Why not? We enjoy it in other corn combo dishes. Thank you. I saw this yesterday and had to get some fresh corn to try it. It was soooo good. My husband's eyes rolled back in his head when he took a bite, which I've never seen in 14 years! He even said he was taking some to work tomorrow. Simple, quick, and low in points to boot! Anonymous, sorry I get an overwhelming amount of comments so I don't always see them right away. I just checked to see if I made an error and you are right, indeed I did have a typo, it's 3 points plus. Thanks for noticing. Funny that I didn't get a response from Gina. And no I am not on the Filling Food Plan. @Anonymous I seriously thought you meant that you eat the husk, I am not kidding! I didn't re-read the recipe amounts…but if you are on the Filling Food Plan (which I am) the corn is "free"….I would count maybe 1 point for the butter but wasn't it light butter? Not funny Cat Chat – ok maybe a little funny. I meant the whole corn (you know what I meant)!!!! In any case don't you think it should be more than 2 points + values for this recipe? I'm just curious because it looks so good. The corn is 2 points + and wouldn't the butter be at least 1 point +? Wouldn't the husk be ZERO POINTS??? Don't just pigs, horses and cows eat husks? I LOVE cilantro, so this sounds like an excellent idea! Sounds like a very smart cat! First off I am new to your site and have signed up for your daily recipe's which I really look forward to. I have already made several of your recipes with great success! As I am a weight watchers member my question is…..how did you come to a points + value of 2 for this recipe when a husk of corn is already 2 points +? Anonymous – Aww, that is the sweetest comment to read so early in the morning! Thanks for starting my day on such a positive note! Cat Chat- you need the husks, that is what keeps the steam in and the corn actually cooks from the steam. Sigrid- Grilling instructions are as follows: Turn the grill on and set to high heat. When the grill is hot, place the corn (with husks on) on the grill. Cover the grill and turn corn often until the husks are charred on all sides, about 20 minutes total. Remove corn from the grill and set aside for 5 minutes. Just yesterday we got our gaz-fired grill. And just 30 minutes ago I suggested to grill corn! How would you do it on a grill, precook? Just throw it onto it? Gina, you are a genius and should be getting big bucks for such a talent! I have been cooking my way through your site for close to a year….I go nowhere else for recipes, just straight to skinny taste.com!! I couldn't of dreamed up a better cooking helper! Your recipes have it all! They are delicious, healthy, easy, and full of variety!! I tell my friends and family that skinny taste.com is the 8th wonder of the world!! this sounds delicious! Can you do it with the corn out of the husk as well? Yes! I OFTEN ADD LIME JUICE AS WELL! Soo good. I add pressed garlic, lime juice and lime zest. Soooo sooooo good!!! Looks delish! A squirt of lime would be yummo on it too! Running out to get some corn right now!!!! I want this in my belly right now! I am in Michigan and we have sweet corn stands on every corner. My house is going to be just like a county fair tonight! Thanks for the inspiration! This really could not be any simpler, you just put the corn in the oven, right on the rack. No soaking, the husks do not catch on fire. And when the corn is ready the silks easily come off. I'm sure the mircro is the same principal, only quicker. I love, love, love cilantro! Never thought about putting it on my corn but will now. We raised fresh corn this year in our garden so I will be trying this. Another super easy way to cook corn and it comes out moist and tender and the silks slip right off… leave the corn in the husks and cook in the microwave for about 4 minutes each… peel back the husks 1 at a time until the silks are left and then pull them off from the top. Be careful, the husks can get hot! The husks hold in the steam so it makes the corn come out nice and tender. So easy! For the cooking challenged – Do you place the corn directly in the oven, or on a baking sheet? I made grilled corn on the cobb two nights ago with almost the exact same butter mixture – only I added a splash of lime juice. It was really yummy!! 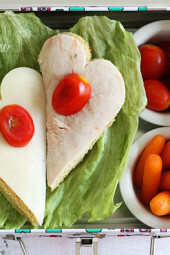 Love this – simple & easy and very pretty! 🙂 Thanks! xoxo from Trinidad!